The Serene Business Telephone Handset/Headset Amplifier gives virtually any business phone or headset an amplification boost, increasing the volume on incoming voices up to 170 times (45+dB). Now the hard of hearing (or any telephone user) can enjoy louder, clearer calls and more comfortable phone conversations. In addition to the volume boost, the amplifier has several features that improve and enhance your listening experience. High Definition Sound (HDS) Technology eliminates virtually all distortion, echo effects and unwanted static. Digital Tone Enhancement boosts and enriches the speech frequencies that you can't hear well, making difficult to hear words intelligible again. Automatic Volume Control optimizes sound level for superior listening comfort. 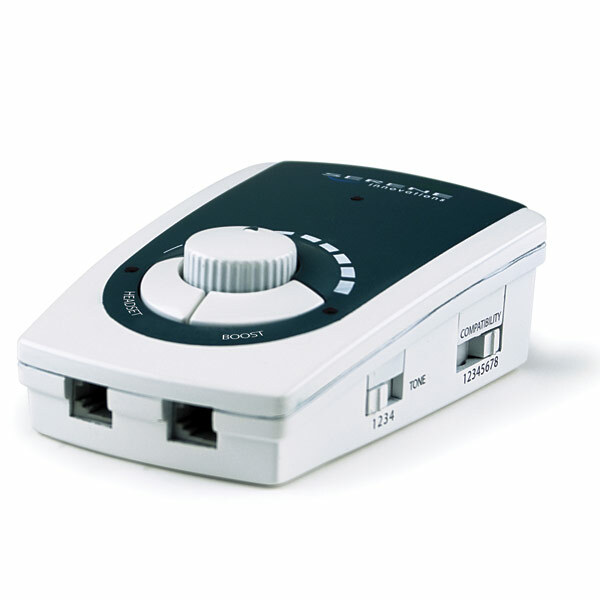 Patented technology enables the Serene Business Telephone Handset/Headset Amplifier to work with any headset with a RJ9 plug (same as telephone handset-cord connector). Powered by AC (adapter included.) One-year warranty.